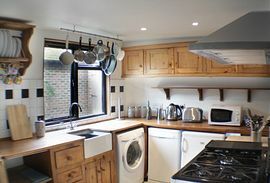 The cottage has been completely refurbished and provides an opportunity to take a moment out of time, in what is believed to be a former home of the renowned traveller, Doctor John Smith. 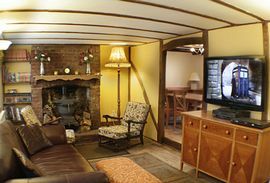 There is a courtyard garden with detached converted Apple Barn, providing additional accommodation. 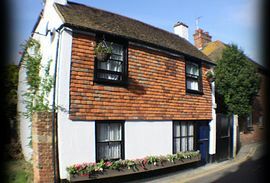 The cottage provides an ideal base for exploring the many historical towns and sites of interest in the local area; and a perfect retreat for rest and relaxation. 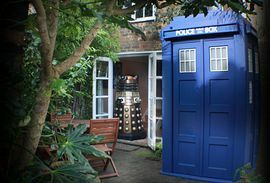 The extensive library of books, DVDs, CDs and games will ensure that, whatever the weather, you will enjoy your stay as a guest of the Doctor. The cottage has wi-fi broadband. The Apple Barn is accessed via the courtyard garden and houses my late brothers private collection of memorabilia, relating to the adventures of the former owner, Doctor John Smith. This includes an extensive library of video recordings and audio recollections. Guests are free to make use of an extensive library of this special collection of DVDs, CDs and books. 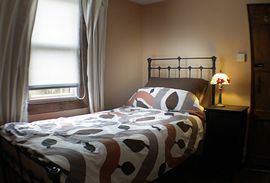 The Apple Barn has a twin bedroom with single beds and its own bathroom with shower. Apple Barn with Tardis and Dalek! Fast train link to Ashford. Rates Friday to Thursday Night (leave Friday). Changover day is Friday- available all year.